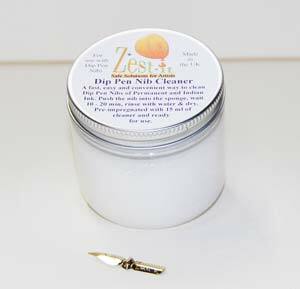 Zest-it Dip Pen Nib Cleaner. Sponge Pot pre-filled with 15 ml ready to use. 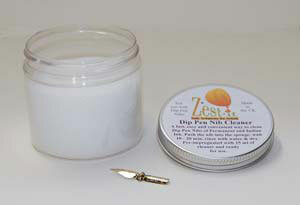 from your dip pen nibs, in a fast, easy and elegant way. 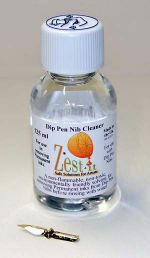 with the new Zest-it Dip Pen Nib Cleaner. 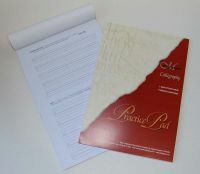 from your nibs, returning them to their former glory. Push your nibs into the pre-dampened close-grained sponge, replace the lid and wait for 10 to 20 minutes.  Remove from the sponge and wash with warm water, wipe dry on kitchen towel or cloth. 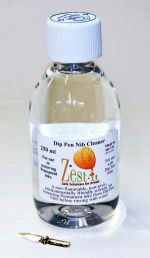 Also available as a 125ml & 250 ml ‘top-up’ bottle.